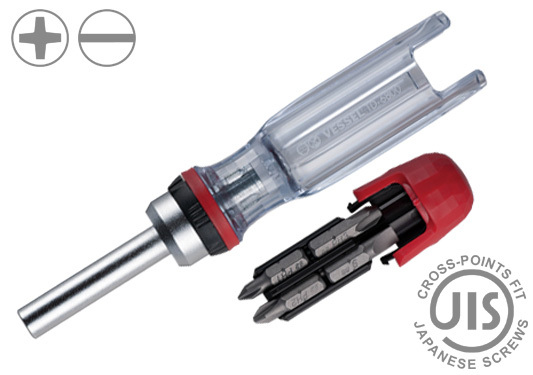 The TD-6804MG high torque ratcheting screwdriver is designed for professional use. It features an accurate and durable 72-tooth precision gear which rotates 5-degrees with every “click” for a very smooth one-hand operation. There are three selectable drive positions that can be set to tighten (dial to the left), to loosen (dial to the right), or it can be fixed (dial in center) when using as a regular screwdriver. Other features include an oil resistant acetate handle, a strong magnetic bit holder, and a convenient bit cartridge that stores bits inside the handle. Ideal for automotive/motorcycle repair and maintenance, furniture assembly, after-sales service tool, DIY housework, and other general fastening needs.